Like most youngsters, Emilie Gill learned to read thanks to picture books. And, like most youngsters, she moved on to chapter books, young adult novels and more. 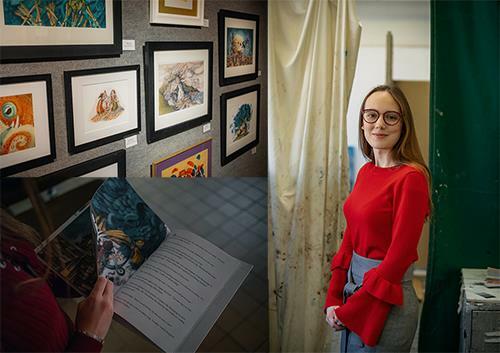 But the WKU senior never closed the book on her interest in picture books and plans to pursue a career as a book illustrator and visual storyteller. Gill, the daughter of Tyler and Sylvia Gill of Allensville, was recognized in December as the Ogden Foundation Scholar during the Potter College of Arts & Letters ceremony. WKU’s top undergraduate academic award is presented to one graduating baccalaureate degree senior who has demonstrated exceptional academic achievement and outstanding university and civic engagement. 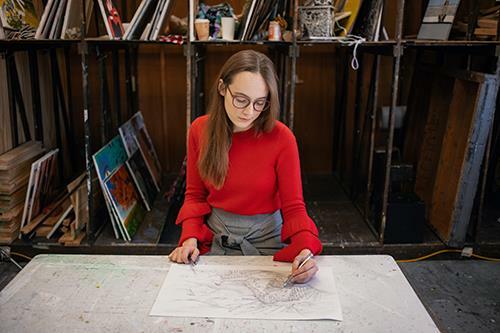 “As an art history/visual studies double major with a geography minor, WKU has taught me that any experience, whether in the sciences or arts, no matter how challenging, is an opportunity to learn and improve my craft,” Gill said. Gill, who plans to begin graduate school in 2019, is a student in the Mahurin Honors College; participated in four study abroad trips to New Zealand, Austria and Ireland; attended a workshop at the Atlanta Center for Puppetry Arts and learned about the history and craft of puppetry; designed props and puppets for the Phoenix Theatre in Bowling Green; interned at Mammoth Cave National Park; and volunteered with the Governor’s School for the Arts. Her awards and scholarships include the Art Department’s Schierferdecker/Lester Award, the Jarve Endowment Scholarship for study abroad in New Zealand, WKU’s 1906 Founders Scholarship and the Potter College Outstanding Student Award in Visual Studies. Her work also was selected as the official logo for WKU’s International Year of Cuba. Gill has been interested in storytelling for as long as she can remember. “I memorized all my books as a toddler and recited them aloud to myself, even before I could read. I was fascinated by the fact that one does not have to tell ‘real’ stories to impart truth, and that some truths can be more powerful and approachable as a fictional story,” she said. A semester in New Zealand at Massey University in Wellington was a pivotal moment for Gill. As a high school student, she had traveled to New Zealand with her parents and had seen the university during that trip. She never expected to study there, but when she wasn’t able to attend Harlaxton College in England for the spring 2016 semester, Gill explored other options. “I typed in New Zealand, illustration and Wellington and the exact program I was looking for popped up,” Gill said. While studying illustration in Wellington, Gill had the opportunity to participate in workshops and conferences that featured artists, designers and others who had worked on feature films produced in New Zealand like the Lord of the Rings and the Chronicles of Narnia. During summer programs in Austria and Ireland, Gill was able to combine her interests in illustrations and cultural geography. “I strengthen those connections by combining art and science in my work,” she said. During the fall 2018 semester, Gill worked as an intern at Mammoth Cave National Park’s Interpretation and Environmental Education department. “Whether I am helping conduct experiments at elementary schools or identifying flora for an international visitor experiencing deciduous trees for the first time, I find people are most engaged in learning and problem-solving via creative activities and relatable stories,” she said. In "A Thousand Words: Celebrating the Power of Visual Language in Picture Books," her thesis for the Mahurin Honors College, Gill conducted extensive research on the history of illustrated books and the development of the picture book market nationally and internationally. Using techniques from books she had researched, Gill wrote and illustrated “The Murmuring,” a 52-page picture book. “I made my story in order to explore techniques that make picture books communicate successfully, such as color, style and more,” she said. Gill finds inspiration in strange or extinct animals, landscapes, farm life, music, folktales and fairy stories of writers like Hans Christian Andersen, Oscar Wilde and C.S. Lewis. Illustrations highlighting those inspirations -- as well as her first piece of artwork, a finger painting done as a toddler in 1997 – have been on display in the graduating seniors exhibit at WKU’s Ivan Wilson Fine Arts Center.